Our Prestige collection has been one of most popular wedding invitation designs since it was launched five years ago. We offer flexibility when ordering your stationery as you can change the embellishment, card and ribbon colour. We have had many requests for the change to be a diamante butterfly embellishment instead of the pearl and crystal that we have introduced it as a permanent invitation collection called Butterfly Lace. It is made with luxurious lace, satin ribbon and finished with a large, sparkly crystal embellishment. One of our customers to make this change was Christina and Frazer who loved our Prestige collection with the lace, but had a butterfly theme and after a bit of a discussion they felt that the Prestige design with a butterfly embellishment with Royal Blue ribbon would be perfect. We were asked to make their on the day stationery and ordered a matching table plan and table name cards all made on white card with royal blue ribbon in our Butterfly Lace. 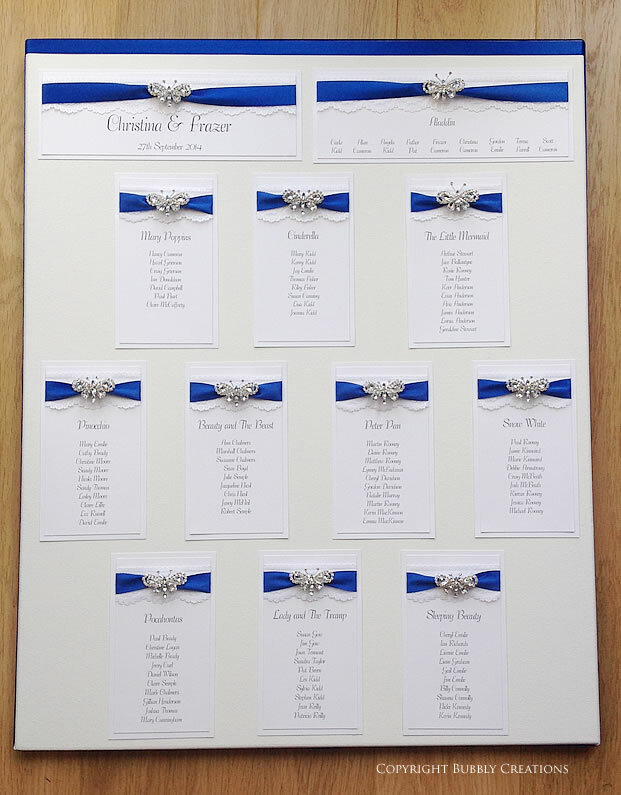 Wedding seating plan with a butterfly, lace, royal blue satin ribbon. 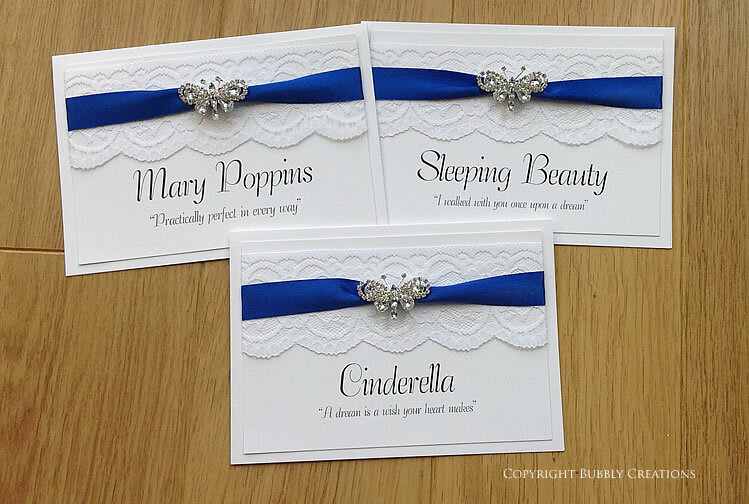 They also had a fabulous theme of Disney films with cute little quotes from the film under the table name and really added extra detail to the cards. Butterfly Lace Wedding Table Name Cards in Royal Blue.